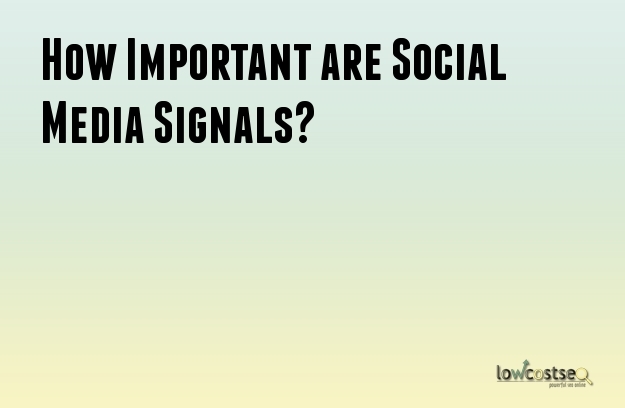 How Important are Social Media Signals? Social signals play an important role in affecting your website rankings. Previously, attention was not paid to the social signals across a large part of the industry. If, for instance, your website is mentioned by authoritative people in their tweets, then others will re-tweet them. This can help with your ranking in the usual search results to some extent. Why and how do social media signals improve rankings? What is the future of the social media signals with regards to SEO? What are the steps to be taken in order to improve your website’s social media signals? Understanding these issues will help readers develop a fundamental knowledge of the main aspects of social media signals as they are linked not only to SEO, but to the goals of online marketing – such as better web traffic, and ultimately revenue. While the direct effects are more or less straightforward, the indirect impacts require elaboration. The world is becoming more and more social. The kids of today are tomorrow’s consumers. They are growing up by communicating on the social media websites. With the aging of this generation, more consumers are going to spend more time on the social media channels, thus creating an increase of the social media signals when they communicate with their favorite brands on the internet. People are already spending more time on the social networks than they do on the search engines. This disparity is likely to increase. People are likely to visit a website that is personally recommended by their friends rather than by the search engines. Websites that have a strong social media presence can be shared and accessed more and hence convenient to recommend. The search engines can analyze the shares as recommendations, increasing the website’s credibility and ranking.